Kate Stanforth was sponsored by Rosedale Leasing in April 2017, to be able to come and stay Calvert Trust Kielder's respite care. 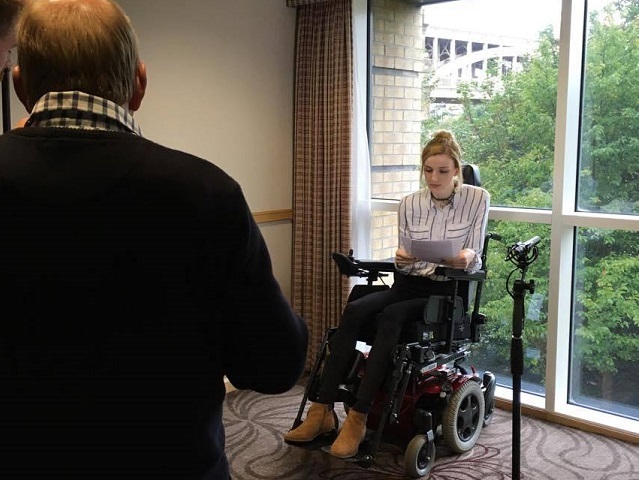 Kate, 23, has a number of chronic illness, that have made her ill for over 10 years. Kate had never been given Respite before and was delighted to accept Rosedale's offer of a week away in the lovely Kielder Forest. During her Stay Kate blogged about her experiences, adventures and at mischievous side and you can read about her stay here. On Friday 13 October, Calvert Trust Kielder is holding it's annual Calvert Ball, at the Hilton Newcastle Gateshead. For the last nine years this ball has been the flagship event on our Fundraising calendar, as having become friends with Kate, we had to have her speak at this year's ball. 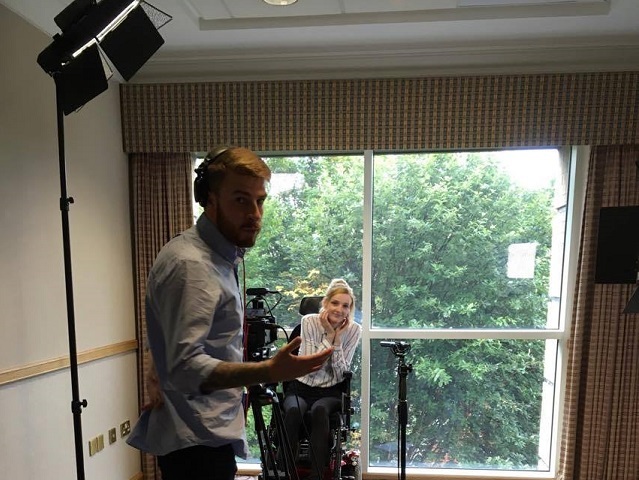 Due to Kate's anxiety, we wanted to help how we could and remove the pressure of her being a guest speaker, the best way was to pre record her speech, so that the pressure on the evening was removed. 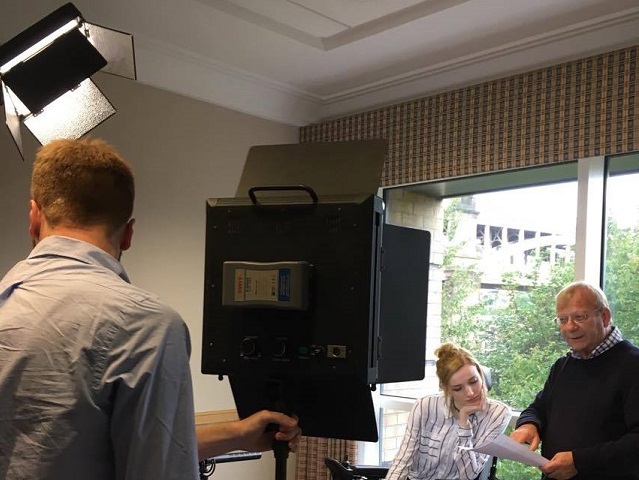 HT Media kindly offered to film Kate as part of their contribution to The Calvert Ball, and the Hilton gave us a spectacular space to film in. With everything in place, Kate and her Mum Tracy met myself and Catherine, along with the HT Media team to begin an afternoon of serious hard work and filming - or in reality an afternoon of laughter and sharing stories. 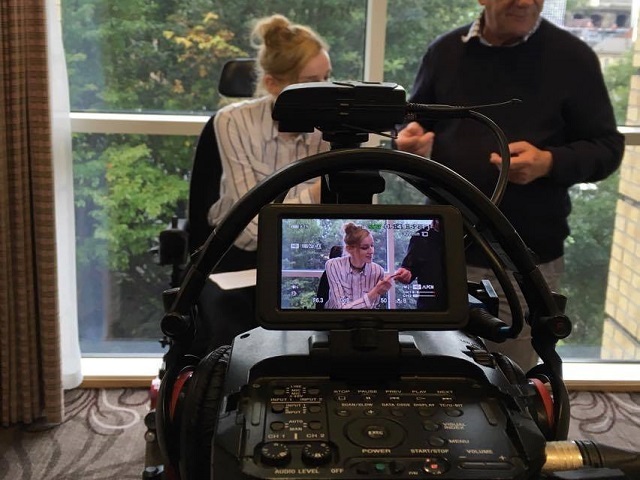 We are so pleased with what Kate had to say and know that the finished video will be fantastic and highlight Calvert Trust Kielder in a perfect and honest way. If you would like to come and see Kate speak at The Calvert Ball and help raise valuable funds for Calvert Trust Kielder, then contact our Fundraising Team on +44 (0) 1434 250232. Christine Cavanagh came to stay at Calvert Kielder with her family - here is what she had to say about her stay. 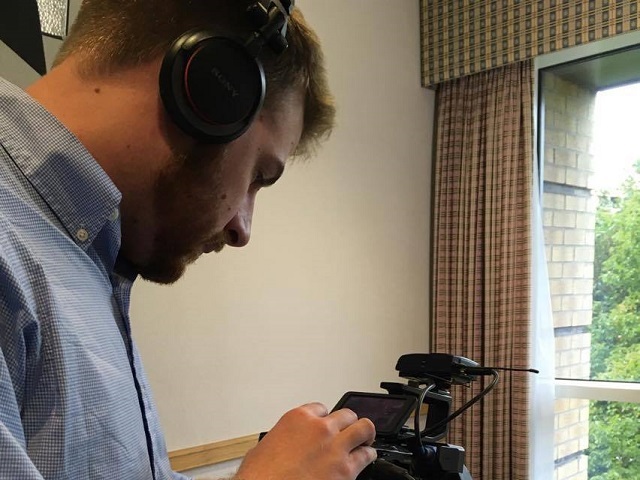 Back in the days of just 2 of us, our weekend away search consisted of filtering results to 5* standards, no more than a 3 hour drive away, luxurious and quirky suites, spa facilities and something different to see every day. It’s a hard habit to break and now we are 3, getting away for the weekend is all about compromise. Or is it? We have found the perfect location for any age or ability with a level of service that you would only see in the leading hotels around the world. Getting to central Northumberland is easy just follow the A1 either North or Southbound and you arrive there. The beauty of the rolling landscape, the Roman history and the clear fresh air all come together within a manageable radius meaning you don’t need to be driving miles during your stay. 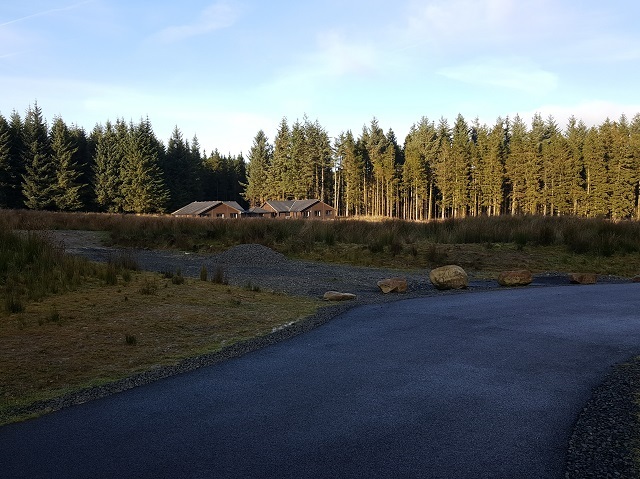 Sat high in the Northumbrian National Park with a beauty and a sense of tranquillity that only the wilderness can bring, when you enter Calvert Trust Kielder a few gears and relax. The word chalet conjures up memories of pink wooden maisonettes in a holiday park in North Wales and certainly not accommodation that has mood lighting, aqua TVs and an en suite complete with steam room. For this reason I shall now refer to The Bradbury chalet only as the luxurious lodge! As serious coffee lovers we armed ourselves with a Cafetierre hastily purchased at Waitrose in Hexham only to find that we had a bean to cup machine in the luxurious lodge, alongside washer, dryer, dishwasher, in fact every kitchen appliance you need... and even a carton of milk waiting for us in the fridge. 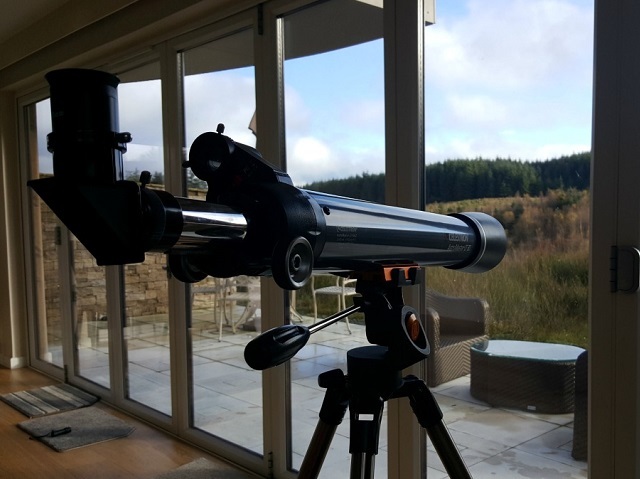 The telescope in the lounge allows you to enjoy Kielders’ large expanse of dark night sky, however I preferred to look at the sky from the discreetly placed Canadian spa hot tub after a perfectly chargrilled steak courtesy of the charcoal barbecue sat on the patio. In a world of increasing intolerance to difference it is important for our children to meet and embrace people who may look, sound or act differently to them. 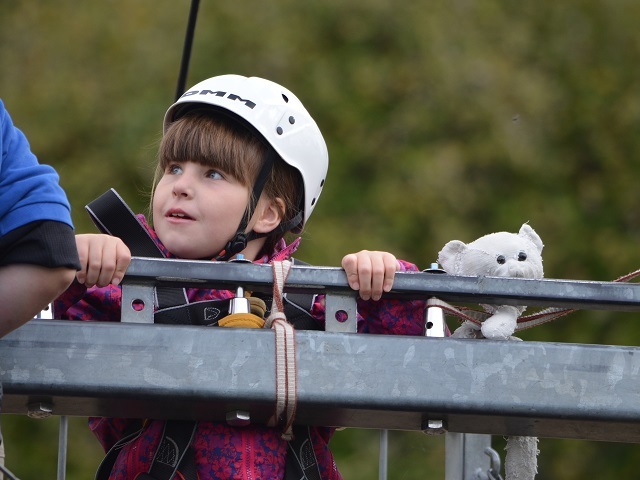 Taking part in activities together as groups in canoeing, rock climbing or the zip wire brings collective benefits. 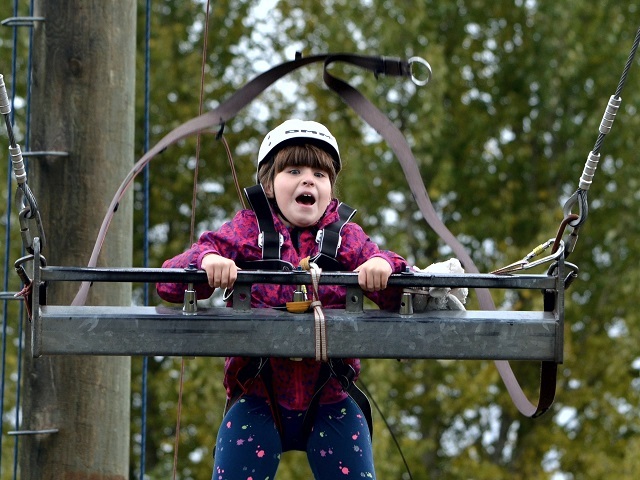 Irrespective of age or need the activities coordinators bring the groups together for enjoyable shared experiences. 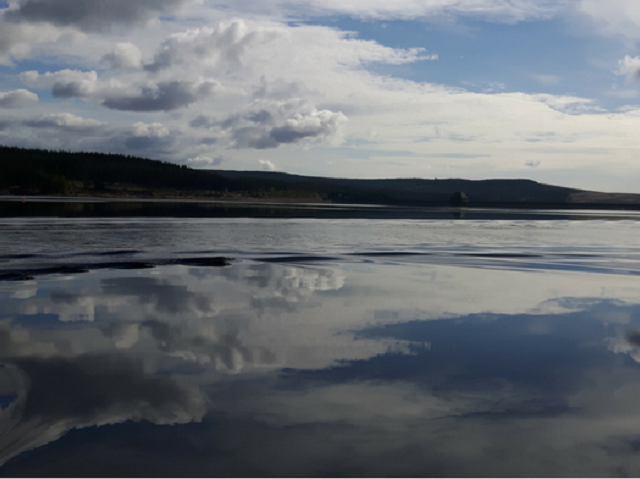 Two hours of canoeing in convoy across stunning waters with a stop off for a flask of Hot chocolate on Kielder Water was priceless. The star attraction has to be the “King Swing” which takes you high into the sky and upon release you swing back and forth – what a sensation. 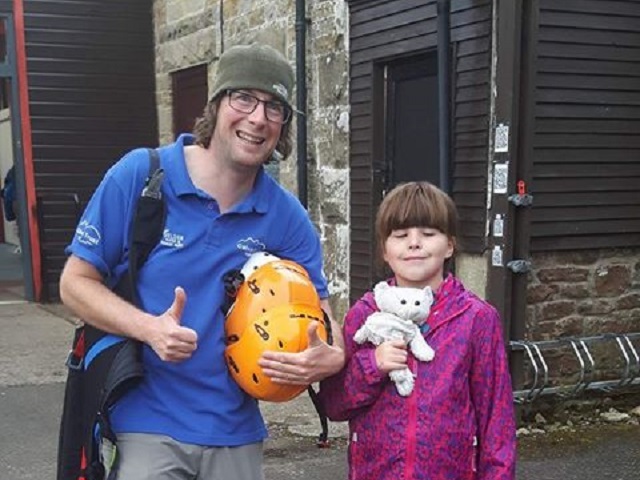 There are naturally other locations to stay at in Northumberland including 5* hotels and bijoux B&Bs but how many of these are reinvesting your cash into supporting outdoor adventure for people with disabilities or providing desperately needed respite care? 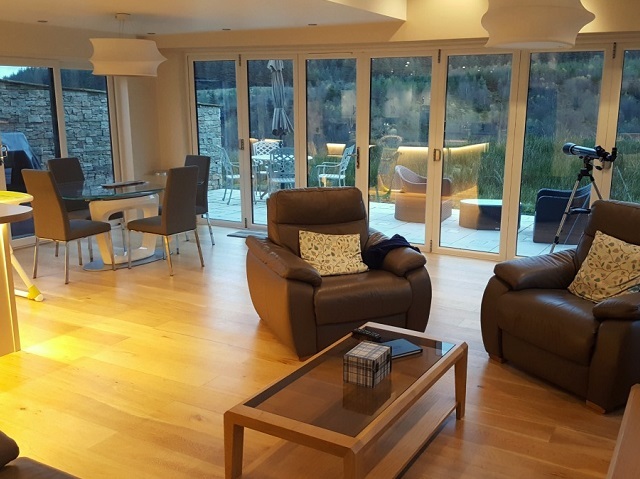 My personal values alongside my superficial needs are both accommodated by staying at Calvert Trust Kielder, perhaps that is why it just feels so good to be there. Finally ... 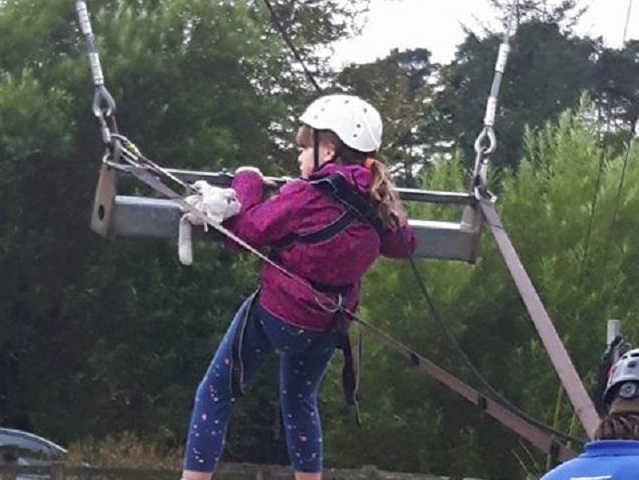 I asked Mariella what she would like to do when she is older... her reply ...to work at Calvert Trust Kielder. We so hope she does. 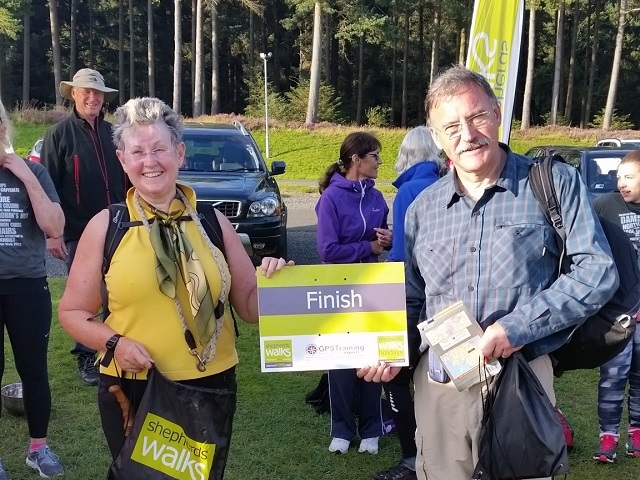 Hexham-based accountancy firm Patricia J Arnold & Co Ltd has raised over £5000 for its 2017 chosen charity, Calvert Trust Kielder, by walking the full distance around Kielder Reservoir. Weeks were spent preparing for this challenge undertaken by staff, family and friends. The effort paid off with 15 of the 19 walkers completing the full distance of 25.3 miles and the remaining four contributing substantially to the total of 428.3 miles walked. 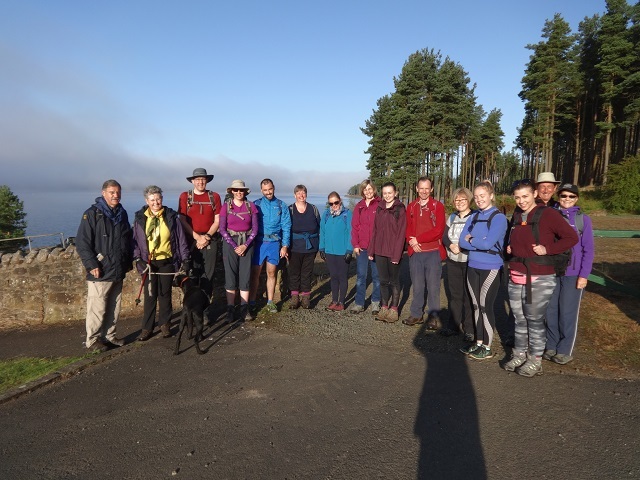 The weather on Saturday 2nd September was near perfect for walking although a stronger breeze might have kept the ever-present Kielder midges at bay! To mark this milestone and celebrate their achievement the walkers and fundraisers held an open evening at their office in West Orchard House for clients, contacts and friends. 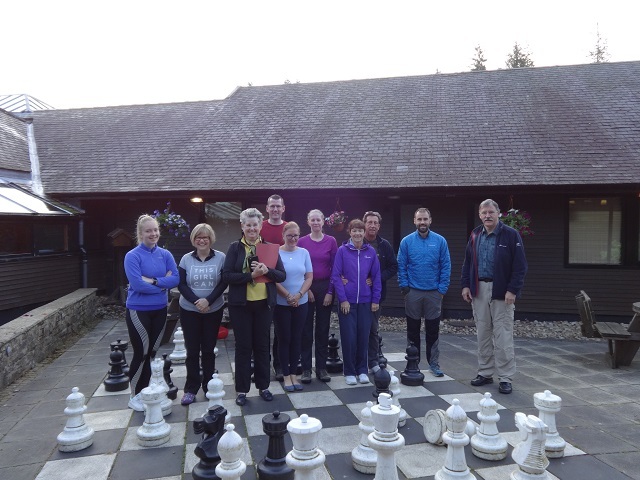 Calvert Trust Kielder is the firm’s chosen charity for this year and in addition to the sponsored walk other fundraising activities have included supporting their golf day and a team visit to the centre and Kielder Observatory. The next milestone on the fundraising calendar is the firm’s silver sponsorship of The Calvert Ball in October. 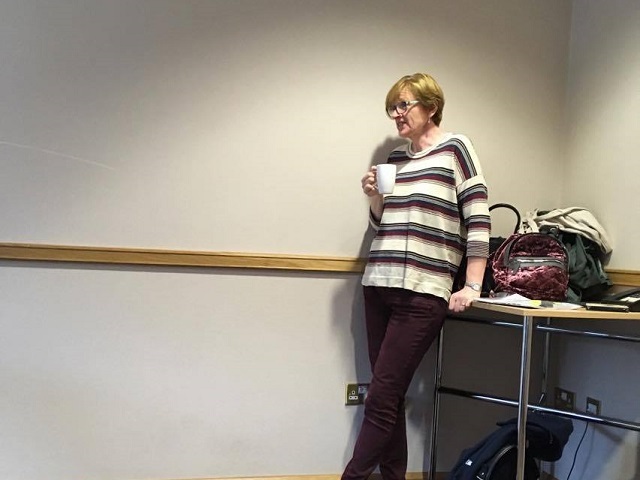 Tricia Arnold, owner and founder of the firm said: “I feel very strongly that any organisation that enables people who confront major physical and mental challenges to live as full a life as possible should be supported. 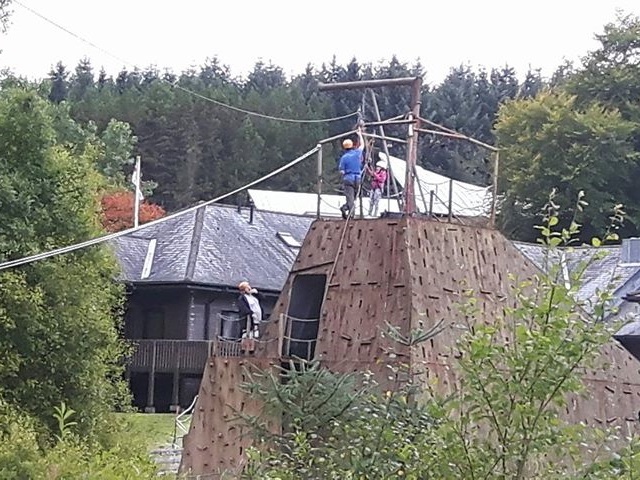 Calvert Trust Kielder does this BIG TIME and we hope we can help a little bit towards their goal.Spending time with the people at Calvert Trust Kielder is also a great pleasure for our staff, we really enjoy our visits to the centre”. 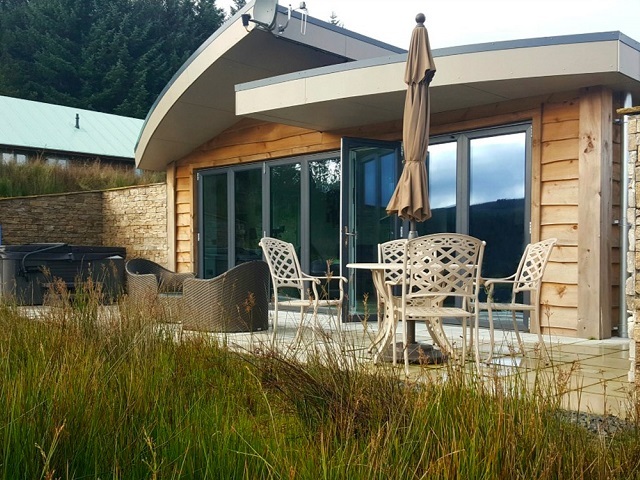 These our hillside chalets have a double, one twin, and a third bedroom consisting of a single and a bunk bed suitable for children, sleeps 7. 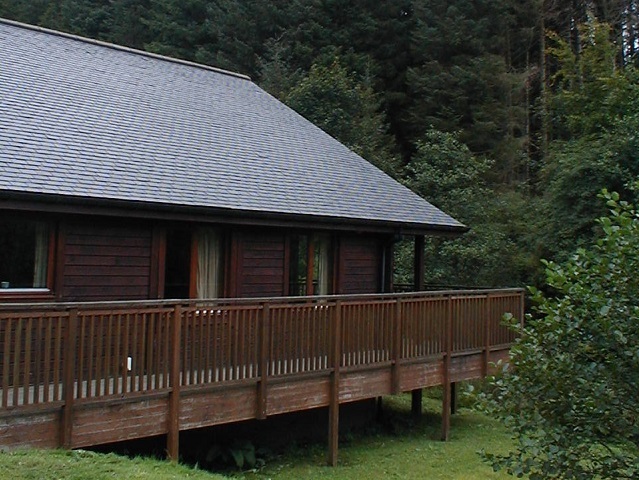 All chalets have fully fitted kitchen, bathroom with level entry shower, and private balcony or decking area. 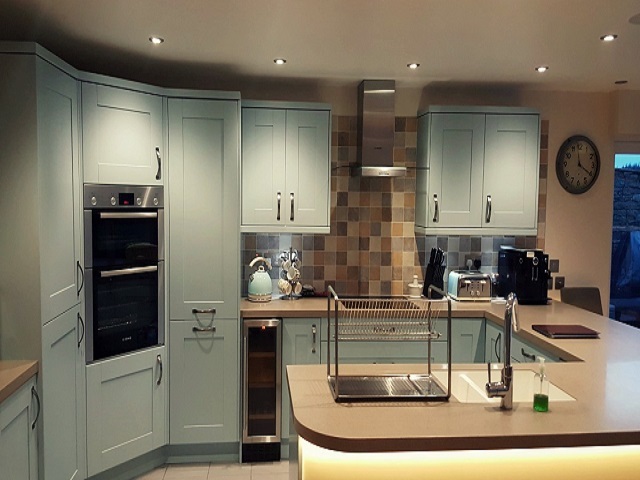 Calvert Chalets are fully equipped self catering accommodation, however our kitchen is open for hearty breakfasts, lunches, evening meals and take-away options. A typical menu can be seen here. DATES Monday 9 October 2017 to Wednesday 11 October 2017. DURATION 2 Nights (Monday to Wednesday night inclusive). HOW MANY PEOPLE CAN STAY? Up to 7 People. SPECIAL PRICE £149, saving £170 (45% off) - as low as £11 per person, per night. CAN DOGS COME? Yes. Please ask about additional fees. 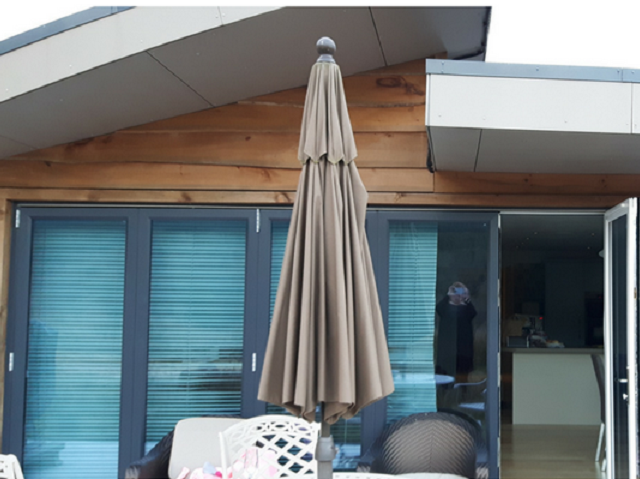 Please all our Sales Team on +44(0)1434 250 232 Monday to Friday from 9am to 5pm or email enquiries@calvert-kielder.com leaving your name and telephone number and we will call you back as soon as we can. 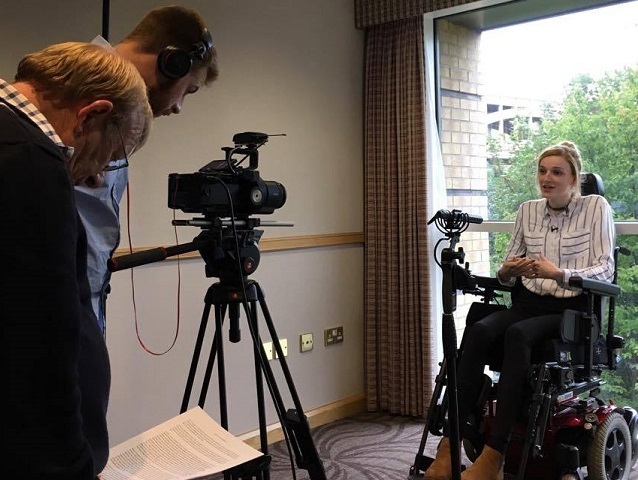 @SimplyEmma is a travel blogger, that writes about her travels as a disabled person. 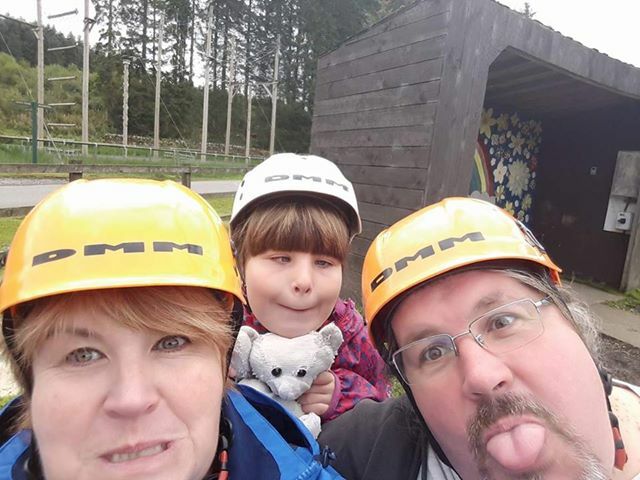 Emma came to stay at Calvert Trust Kielder last year and loved it so much, she blogged about her time. Read about Emma's stay in our Bradbury chalet below. 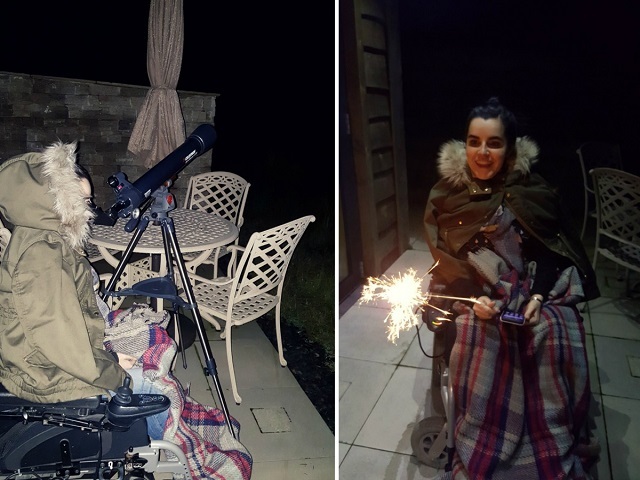 I’m always on the lookout for wheelchair accessible holidays within the UK, so when I discovered the fantastic Calvert Trust Kielder I knew I had to make a booking. 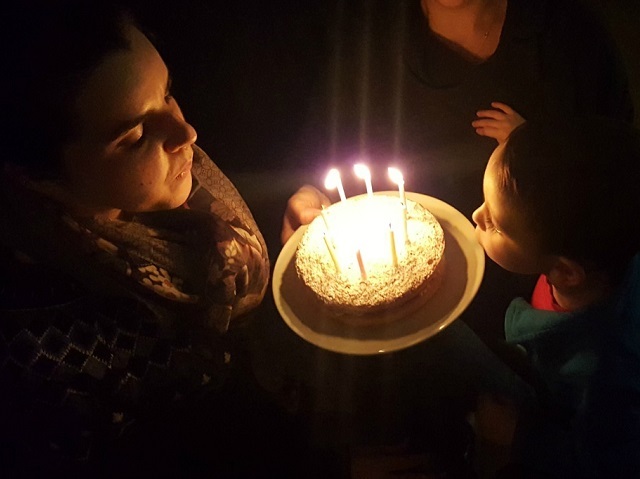 In November 2016, I got to spend my birthday last year in the middle of the forest at Calvert Trust KielderKielder and it was one of the best birthdays I’ve ever had. 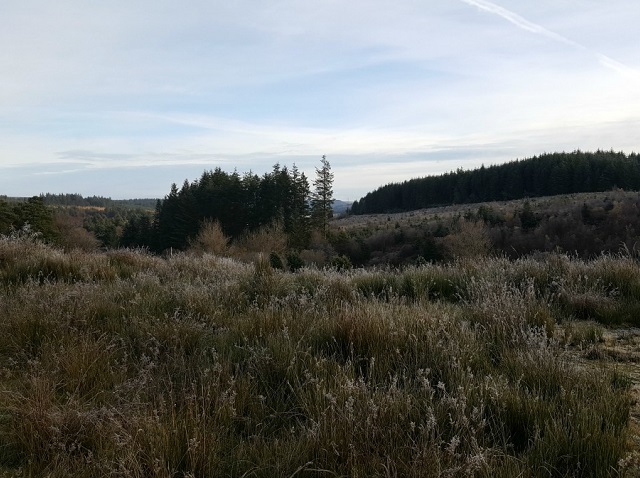 As our Nephew was coming along with us on this trip we didn’t want to book somewhere that involved a long drive, so Kielder was the perfect choice due to its short two and half hour drive from home. Calvert Trust Kielder is set amongst Kielder Water & Forest Park so you can imagine how beautiful it is. Trees and water for as far as your eye can see. We arrived around 3.30pm and headed for the reception to check-in. 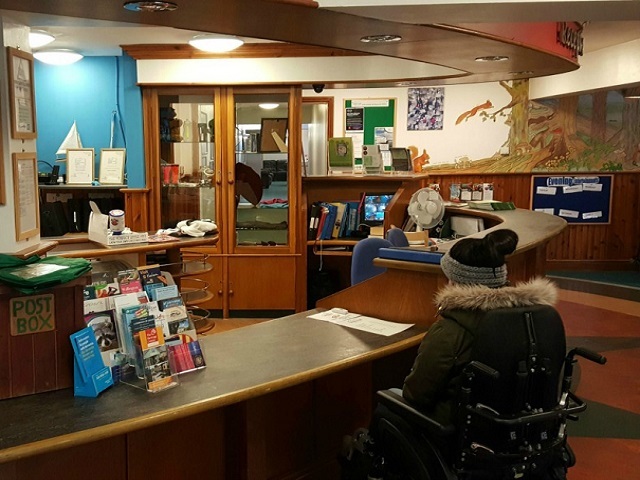 The reception desk has a lowered section for wheelchair users, so this made it easier when I was speaking to the staff. Even though check-in is 4pm we were given our key and allowed to head off to our chalet. We were also given an information pack full of menus, activities, local info and more. It was freezing outside so we were glad to be able to get to our lodge early, get dinner and enjoy the rest of our night. Our lodge was located a short drive/walk from the reception centre. Our home for the next three nights was the stylish Bradbury Chalet, which we all fell in love with as soon as we stepped inside. Even from the outside, we could tell we were in for an amazing time. With the car parked under the carport, my partner and sister began to unload the umpteen bags (bearing in mind we were only there for 3 nights) while my nephew and I went inside to get out of the cold and have a look around. The chalet felt warm and welcoming from the icy temperature outside. 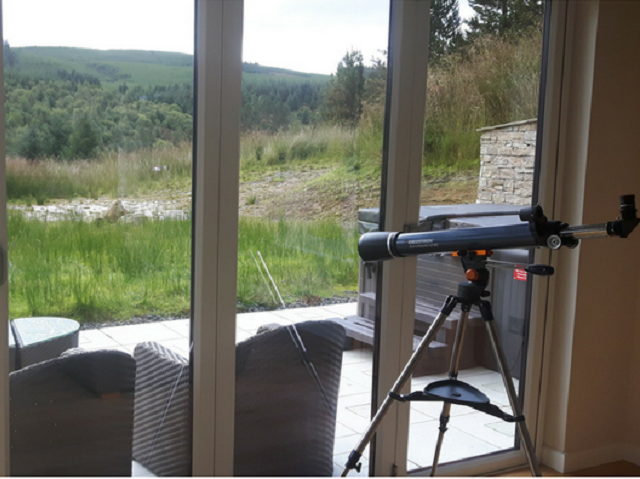 The first thing my nephew spotted was the telescope sitting in the living area facing out onto the beautiful forest view. The view could be seen from the open plan living, kitchen and dining area through the bi-fold patio doors, which opened onto the private terrace. I loved the open plan layout as there was so much space to move around and I didn’t feel restricted as to where I could go in my wheelchair. It was perfect! The living area had a large flat screen TV with Freesat/DVD, comfortable sofa and armchairs (I even parked my bottom on one of these) as well as a range of books and board games. The kitchen was one of my favourite areas (even though I don’t can’t cook). I loved the modern look with the pop of colour of the cabinets. The open plan kitchen made it easier to observe my meals being prepared for me (it’s a hard life I lead haha). The kitchen had state of the art appliances and gadgets. The cabinets were easy to slide open and there was a pull-out pantry too. The wide hallway divides the living and kitchen area from the bedrooms. There were two bedrooms and two bathrooms as well as two cupboards, one of which stored a shower chair. My room was the master bedroom suite with a king size bed and ensuite bathroom. The bed was comfortable and had the most luxurious bedding to keep me warm during the cold nights. 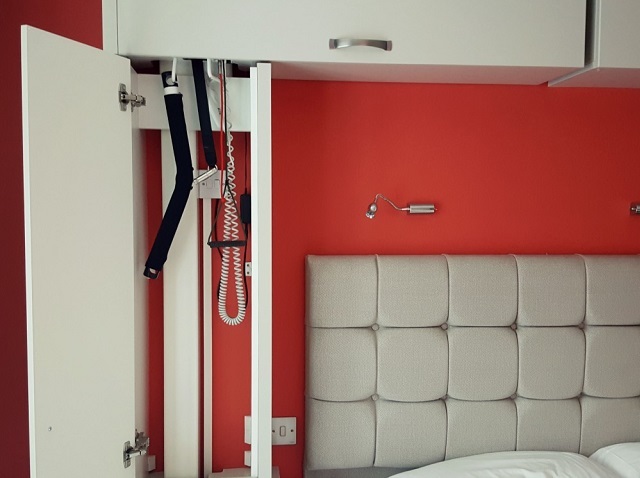 You’d never know that this bedroom has an overhead hoist for disabled guests as it’s fitted discreetly inside the units surrounding the bed. I thought this was a great feature to save space and was something I’ve never seen before. There was mirror wardrobes on one side of the bed and plenty of space on the side with the hoist. This meant there was enough space to park your wheelchair either for manual transfers or when using the overhead hoist. A telephone with big buttons was placed beside the bed, which is ideal for people that may struggle with regular telephones. The master ensuite bathroom was another favourite and one of the coolest rooms within the chalet. It was a huge hit for us all, but especially for my nephew. 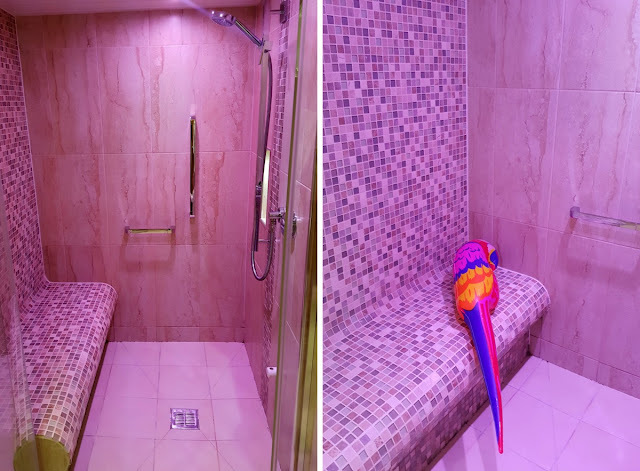 One of the features that my nephew loved was the colour changing lights, which could be adjusted from either inside the shower, next to the bath or at the bathroom door. He had a great time changing the lights to whatever colour he wanted, but orange being his favourite (this boy loves the colour orange). 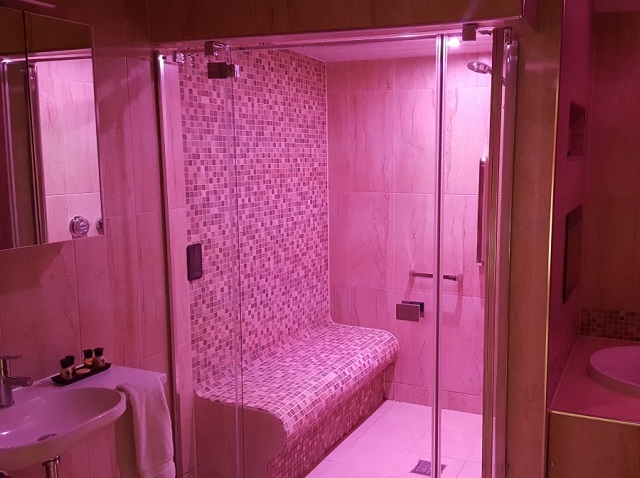 The shower and steam room had a lovely mosaic seat, but if you prefer you can also use the shower chair instead as there was enough room for it. 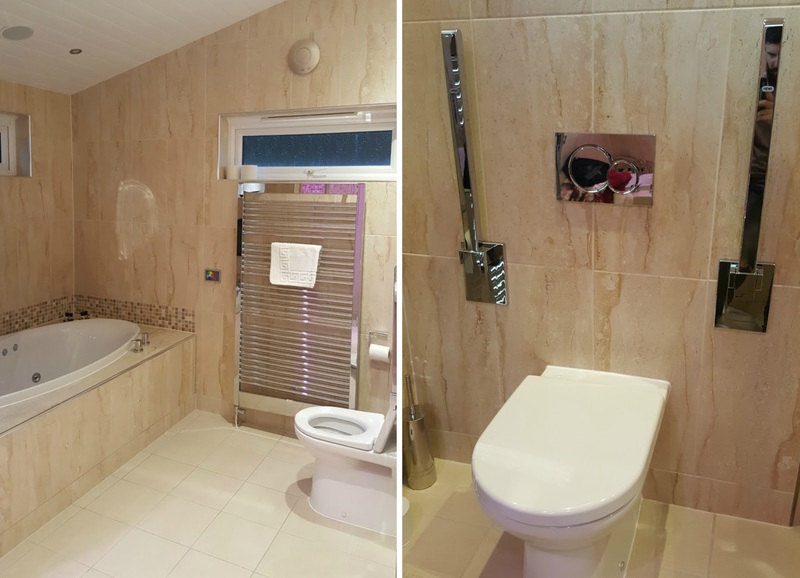 The shower controls were positioned within reach and there were chrome grab bars for support. 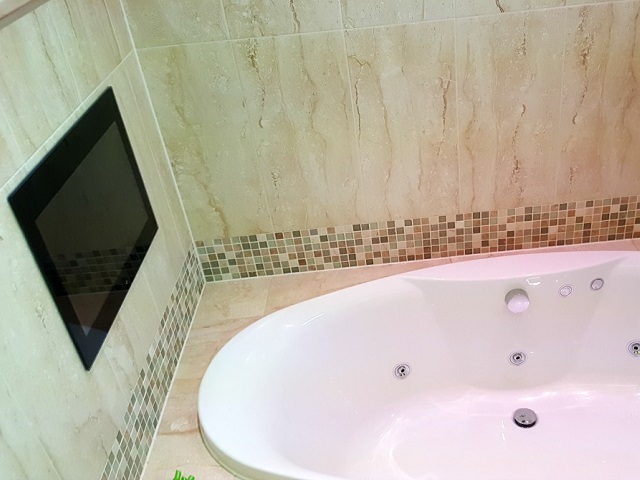 The jet spa whirlpool bath was massive and had a TV built into the wall with a waterproof TV remote. 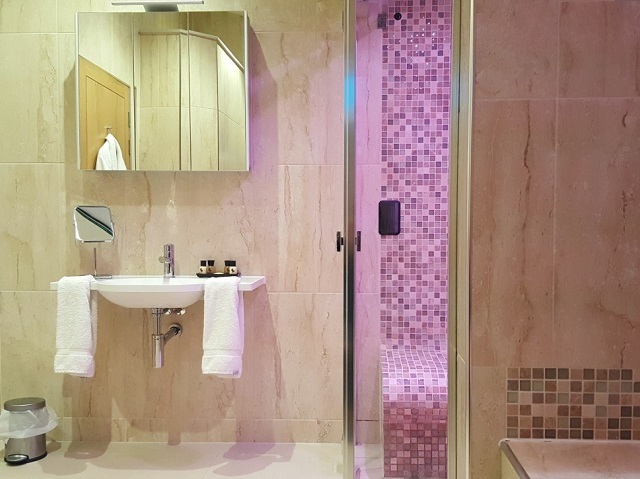 There is no hoist or bath riser to help you in and out of the bath, but if you can manage independently you may find the wide ledge around the bath helpful to sit on while lowering yourself in and out. The toilet was opposite the bath, but there was lots of space for manoeuvring my wheelchair. 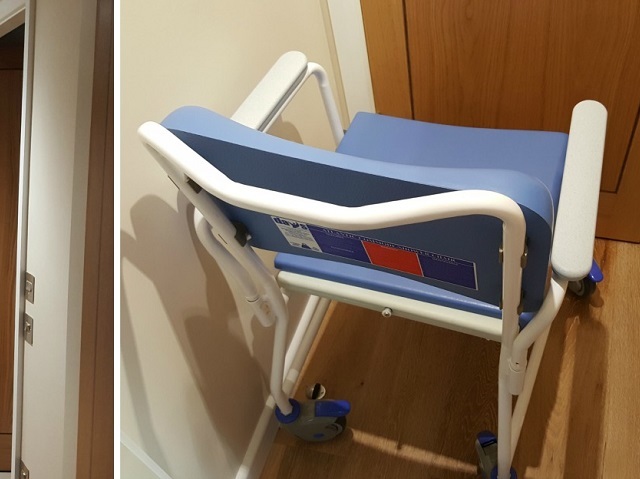 The position of the toilet allows for left-hand wheelchair transfers and there is enough space for the use of a portable hoist. Chrome grab bars were on each side of the toilet for extra support. The roll-under sink was perfect as it was a good height and size, which meant I was able to wash without any difficulty. The sink had hand towel hangers built in so it was easy to wash my hands etc without having to reach too far for a towel. 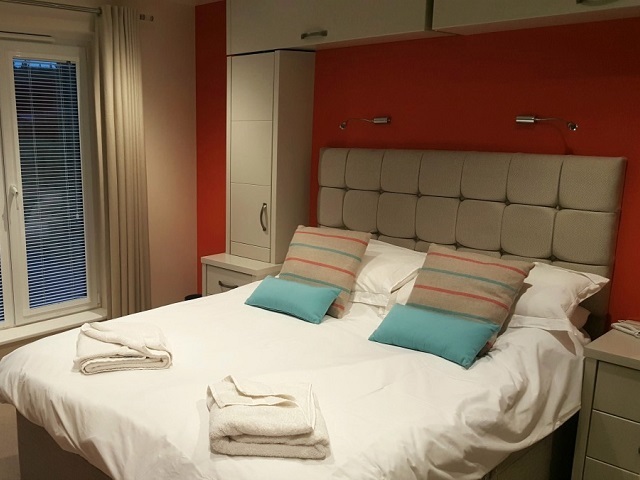 The second bedroom has twin beds that can be joined to make a double bed. This is where my sister and nephew slept. I found this bedroom to be a lot smaller and there wasn’t much space for a wheelchair to move around. A flat-screen TV was wall mounted opposite the beds. There was a second toilet in the hallway, which was also smaller than the master bathroom, but there was still enough space for my wheelchair. It had a pedestal sink, walk-in shower and toilet. Grab bars at the toilet and inside the shower. The colour changing lights also featured in this room. 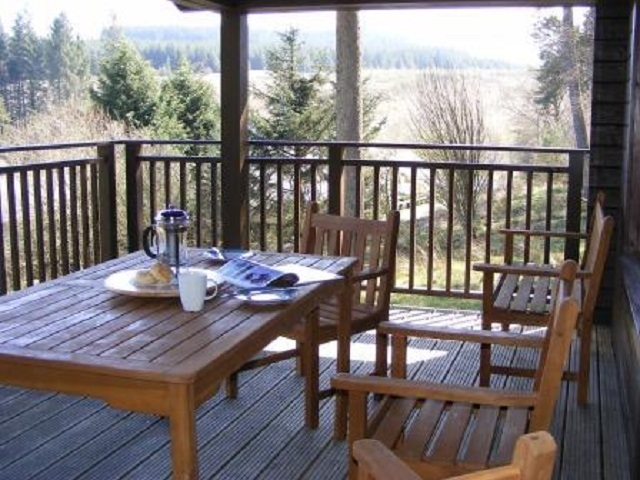 The Bradbury has a lovely private patio terrace with garden furniture, BBQ grill and hot tub. Everything you’d need for a fun, relaxing time with friends and family. What I loved the most about the patio terrace was that it was completely private and even though there was a chalet on either side of ours, it was difficult to actually see them which was down to the stone wall shielding us. This provided privacy for the hot tub and gave a true sense of being secluded in the forest. The view was absolutely stunning. It was lovely to wake up in the morning and look out to the frost covered trees. It gave the feeling that Christmas was just around the corner. It would be lovely in all seasons, but I would love to experience a stay in this lodge during the summer months when the weather is warmer and we could enjoy a few BBQ’s in the sun. The patio is well lit at night with spotlights and a nitecrete™ illuminated path, which glows in the dark. We found this helpful when we were outside star gazing, as Kielder Forest has some of the darkest skies in Europe. It’s a truly magical place to see the stars in all their glistening glory. As we were celebrating my birthday at the chalet we decided to take a pile of sparklers to have some fun with on the night of my birthday and even though it was -4 outside we had a great time. There is no need to leave the site during your time at Calvert Trust Kielder if you don’t want to. 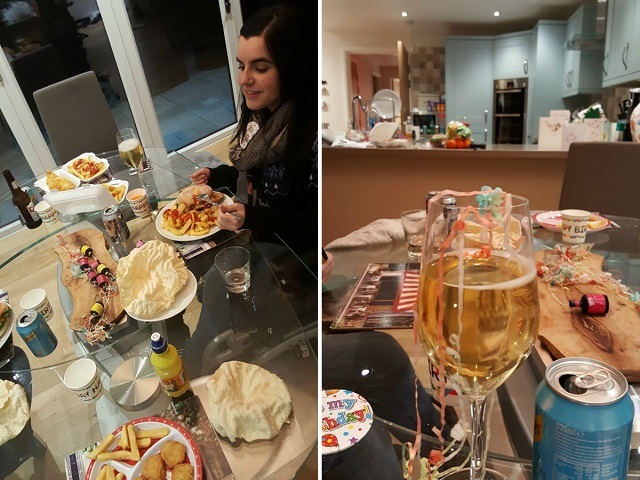 As our holiday was self-catering we made sure we had enough food and drink to last the duration of our stay. However, we did order takeaway food from the sites very own restaurant/dining room on our second night, which was my birthday. All we had to do was choose what we wanted from the menu and call the number provided in the information pack. All orders must be placed by 4pm and collected by 5.30pm. The food was really good and although we were all stuffed, we made sure we had room for the lovely gluten free birthday cake my Sister made for me. She did so well making it and it tasted delicious. The Bradbury was full of the latest technology and mod-cons. 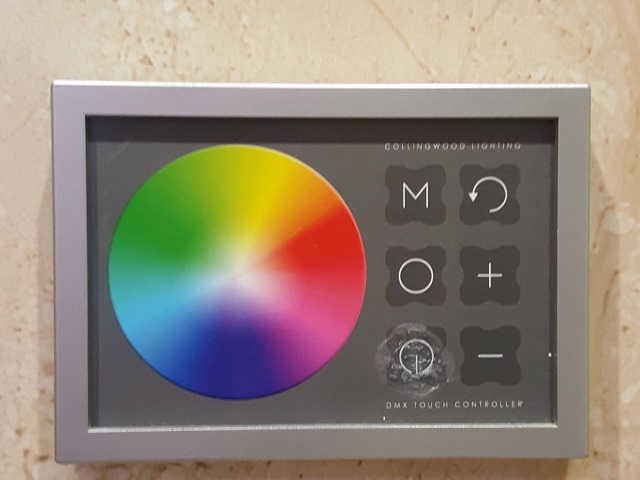 The telephone, radio/music system, colour-changing lights, iPod docking station, remote-controlled blinds were some of the featured gadgets within the lodge. 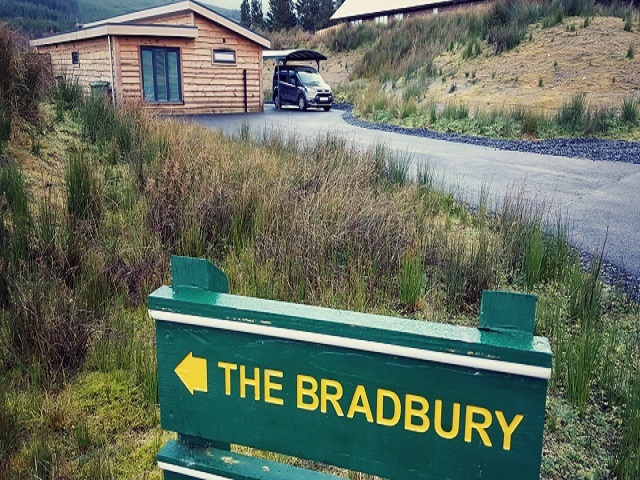 The Bradbury Chalet at Calvert Trust Kielder was the perfect choice for our accessible holiday to the Northumberland Forest. It exceeded our expectations and left us wanting to return again (and very soon). Not only was The Bradbury stylish it was completely accessible. This was a refreshing experience as all too often accessible lodges can seem very hospital like, this couldn’t be further from the truth. 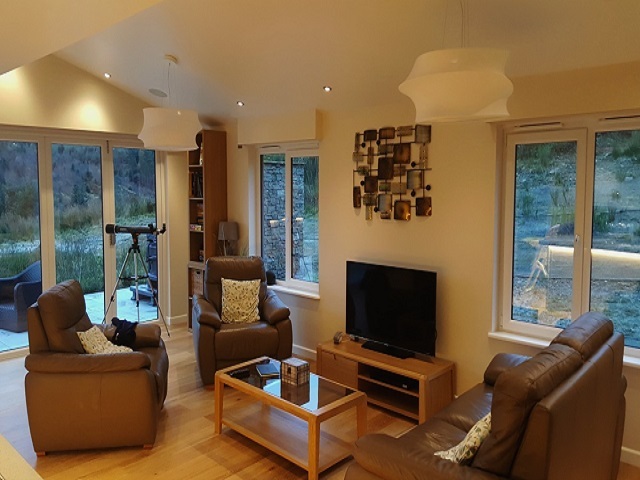 Calvert Trust Kielder have got it all worked out from the range of accessible chalets to the accessible outdoor activities. 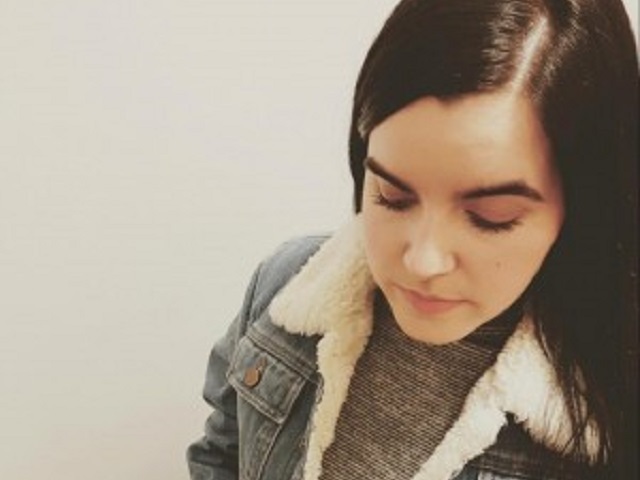 To read more about Emma's other articles please visit her Blog. This particular chalet has one double and two twin bedrooms sleeping 6. 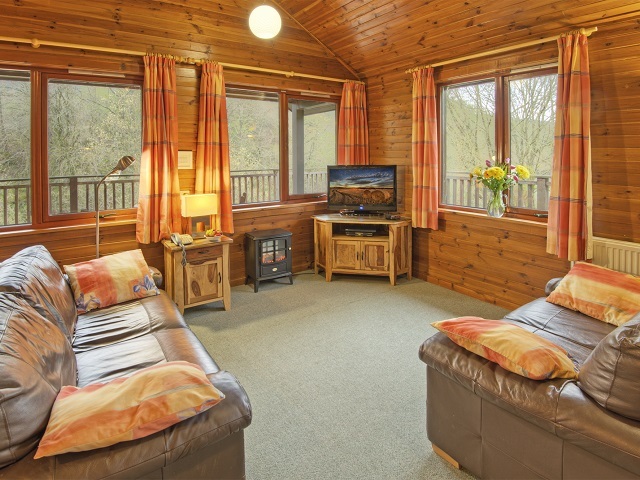 All chalets have fully fitted kitchen, bathroom with level entry shower, and private balcony or decking area. NUMBER AVAILABLE This is a one-off opportunity. DATES Wednesday 27 September 2017 to Friday 29 September 2017. DURATION 2 Nights (Wednesday to Thursday night inclusive). SPECIAL PRICE £199, saving £120 (39% off) - as low as £17 per person, per night. CAN DOGS COME? Sorry, not this time. 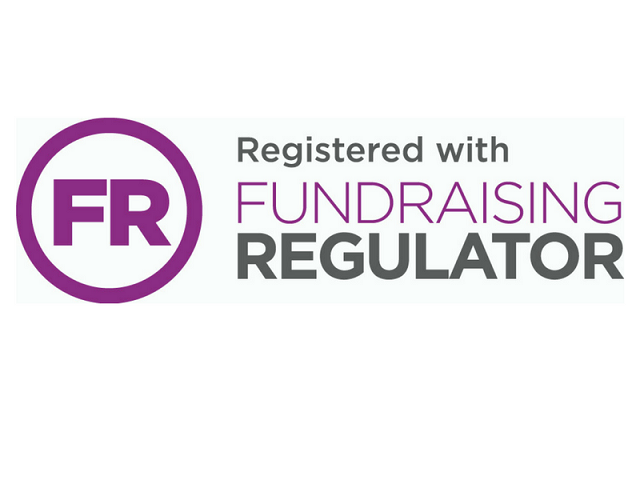 DATES Monday 25 September 2017 to Friday 29 September 2017. SPECIAL PRICE £399, saving £330 (45% off) - as low as £17 per person, per night. 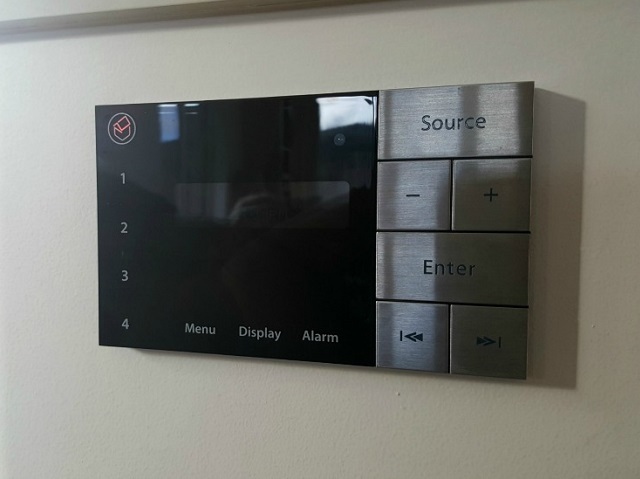 Please all our Sales Team on +44(0)1434 250 232 Monday to Friday from 9am to 5pm or email enquiries leaving your name and telephone number and we will call you back as soon as we can. 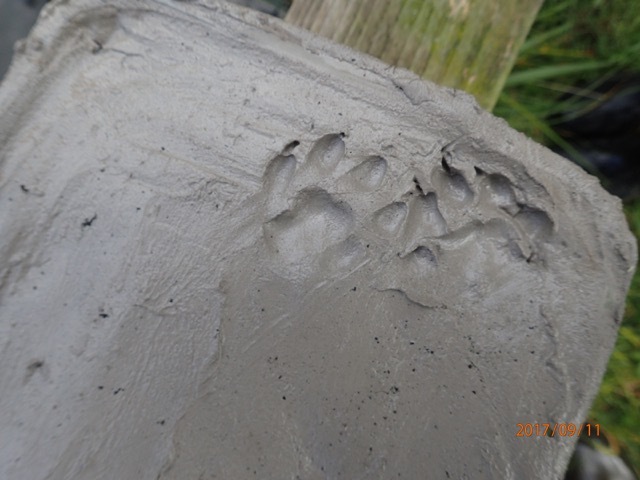 Following on from our recent Otter sighting on the burn, Otters have now been leaving tracks at the bottom of our nature trail, where rafts had been left to capture any water Vole activity. Water Voles are currently being reintroduced to Kielder by Northumberland Wildlife Trust, thanks to funding from the Heritage Lottery Fund and the support of partners in the Forestry Commission and the Tyne Rivers Trust. 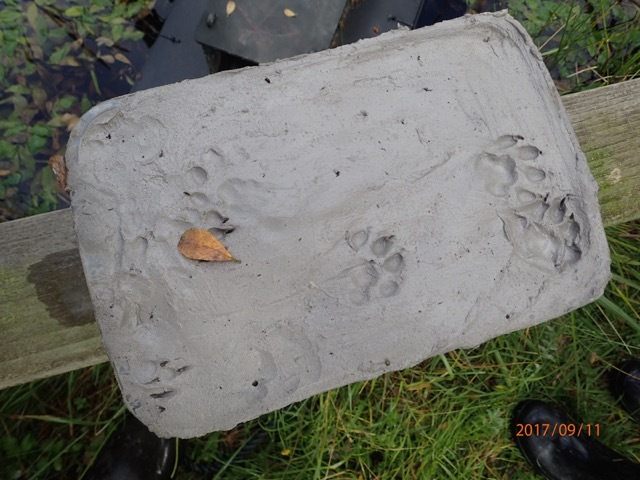 Whilst the tracks were not Water Voles, it is great to know that our family of Otters is still thriving on the burn and we hope to see much more of them. If you would like to know more about the restoration of Water Voles then please visit Northumberland Wildlife Trust's Facebook page Restoring Ratty.